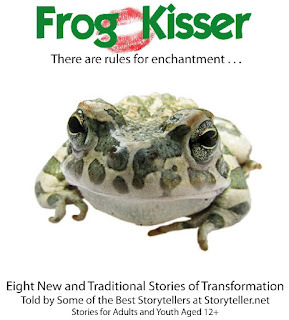 Storyteller.net releases a new storytelling CD titled "Frog Kisser" with stories including "The Frog Princess" and seven other tales of enchantments. Especially for adults and teens, the CD is available now from Amazon.com. Avondale, AZ- Storyteller.net announces the release of their latest storytelling audio CD "Frog Kisser." "If you are looking for a story of the princess and the frog, we've have that as well as seven more unusual tales of enchantment and changelings," says Sean Buvala, director and producer of the CD. The "Frog Kisser" CD is now available at the FrogKisser.com website as well as Amazon.com. Featuring the work of seven unique storytellers from around the United States, the CD contains eight stories that are designed for adults, teens and tweens. Buvala, also one of the performers on the audio CD, continued, "All over the world, there are many stories of beings changed through love, commitment and challenge. In this CD, we have captured both world folktales and original stories to remind folks that things are not always as they seem." Comments from and about all seven storytellers are available at www.frogkisser.com. "We know that in this 2009 holiday season, with the latest Disney animated movie, there will be renewed interest in the stories of enchantments. We created this CD so that folks who would like to explore great stories of changeling beasts can do so with a mix of traditional tales, original works and new perspectives on old themes," says Mr. Buvala. The "Frog Kisser" project is a unique listening opportunity for fans of storytelling. "Our CD is unusual in the storytelling world. There have been very few collaborative storytelling projects like this at the national level, and nearly none that are aimed at a slightly older audience like 'Frog Kisser'," said Buvala. 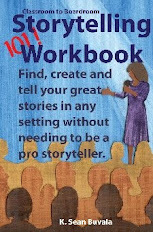 "I went to some of the best storytellers from our Storyteller.net site and invited them to join me on this new creation. We're very happy with how this turned out and I am looking forward to the next project and new discoveries with other good storytellers." Sean Buvala, a 23 year veteran of national storytelling, is available for expert consulting and media interviews on the nature of storytelling, fairytales and legends connected with this project and all media releases based in story and storytelling. Here's a picture of the first fresh-off-the-press DaddyTeller™ book! You can order yours from Amazon if you'd like. Also, there are many free training videos on the www.daddyteller.com/vids site. About Sean: From the DaddyTeller™ Site. K. Sean Buvala is a Trainer, Corporate Coach, and Speaker. But first and foremost, he’s a Storyteller. If you’re anything like me, this word evokes images of rapt little faces gathered round the yarn-spinner, mouths agape, hanging on every word. It should. Storytelling is an art that appeals to the deep emotional memory in all of us. Unlike motivational speaking, which seeks to uplift the listener and spur to him action, storytelling strengthens our powers of creativity and problem solving by drawing on our own imaginations. In short, storytelling conveys information in a way the listener will never forget. In 2007 Sean Buvala was presented the Oracle Award by the National Storytelling Network for his work in the promotion of storytelling, including the development of Storyteller.net, an online goldmine of resources for storytellers and their audiences alike. His work as a trainer and coach in the corporate word demonstrates his ability as a master storyteller. On the premise that good leadership requires strong communication skills, good storytelling techniques and the ability to convey information with impact, Sean designs workshops and seminars specifically for corporate groups, where he trains leaders to lead more effectively by improving their storytelling abilities. Here, he teaches real skills—not theory—that corporate management can implement immediately. In executive-level workshops that identify what already works for the company and what needs fixing, participants are shocked to see dramatic improvement in their public-speaking and leadership abilities. Now Sean has applied his years of experience as a storyteller—and, not incidentally, father—to a project designed to help Dads convey valuable information to their own children. 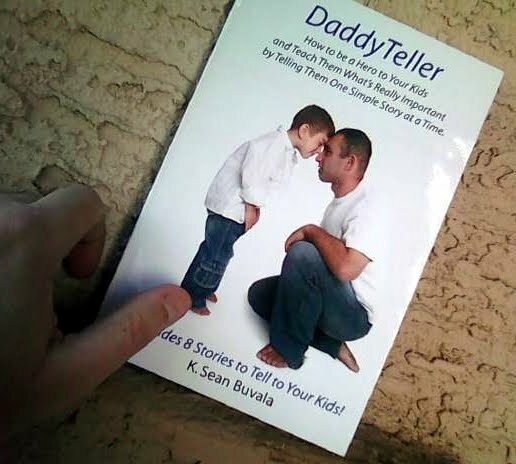 DaddyTeller: How to be a Hero to Your Kids and Teach Them What’s Really Important By Telling Them One Simple Story at a Time is a step-by-step e-book guide for teaching Dads to become storytellers for their kids. As the father of four daughters, Sean knows this subject intimately. Based on the premise that any father can learn to tell his children stories that convey values and ethics to his children, DaddyTeller offers nine simple stories (eight plus a bonus) aimed to turn story time into a meaningful and loving experience for both parent and child. Beyond the book, Sean provides ample support, not just for Dads but for anyone who wants to learn to tell a story with impact. His video clips and audio files are abundant. Watching him perform is inspiring, and even if all you do is watch, I guarantee you’ll tell your next story with just a touch more panache. Sean describes his own style as somewhere between “in your life and in your face,” depending on his audience, and he has ample opportunity to adjust his approach. In addition to his work with teenagers, he is an expert presenter for corporations, teachers’ groups, colleges and universities, nonprofits, and faith-based organizations. His expertise includes communication and presentation skills, group dynamics, arts marketing, theatrical training, ministry management, and entrepreneurial development, to name but a few. A hush settled over the room. He grabbed the next two boys and placed them next to the first one, where they became the sons. In turn, he brought each child up to be cast as an actor in the story. And the rest is, well, history. You can learn more about or buy the DaddyTeller™ book at this link now. There are many more free DaddyTeller™ videos at this link here.